What I am saying is that finding the balance between the necessary, the special splurges, and where to save money is certainly difficult. I get it. I in no way found the perfect balance, but I just want to offer a little insight on ways I saved money and ways I wish I would have saved money. I'll also give you a few tips I discovered on how to get deals, so read on bride-to-be, I hope this is helpful for you! 1. First and foremost, set a budget. Doesn’t matter if that budget is cushioned or tight, set one. If you don't, you'll find yourself easily spending way more than you intended. And beware, things will sneak up on you left and right that you didn’t plan for, so set a budget ahead of time. 2. Go to a bridal show or open house! Often times, when you go to an open house, vendors there will give you discounts for booking with them after seeing them at a bridal show. I'm not guaranteeing this but it's worth a try! Let's be real, for most a Saturday wedding is ideal. But that's not always ideal for the budget. Think about choosing a Sunday or Friday wedding instead— it's super common these days and way more affordable. I had mine on a Sunday and honestly loved it. People who love you will come regardless if they have to get up early for work the next morning! Ok, invitations are expensive. This was one of the costs that I did not expect to be so expensive, and I just couldn’t get myself to spend the money on them. Instead, I designed my own (or you could have a friend) on Illustrator and got them printed with Vistaprint, and they run TONS of good deals. They weren't as fancy as some, but they got the job done and our people got the memo! 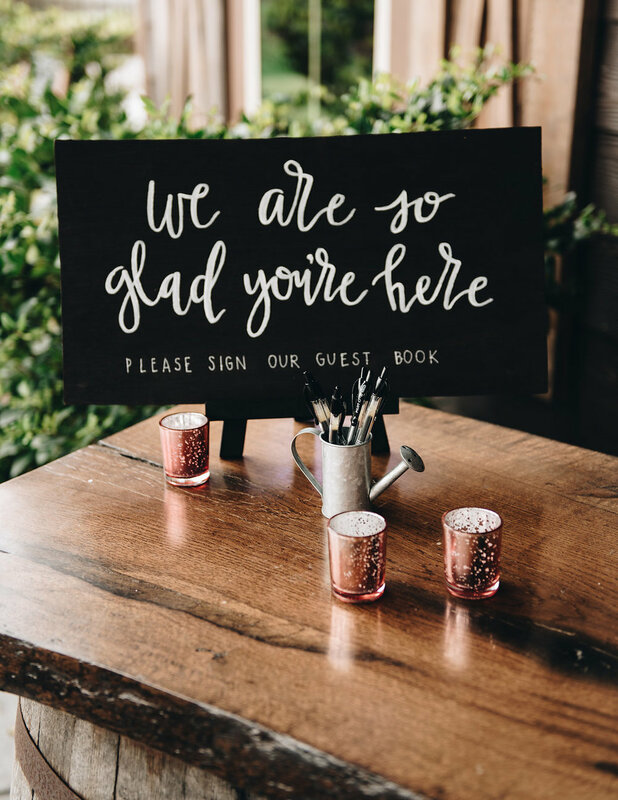 Online RSVP's via a website like The Knot or Minted is not just convenient for your guests and you, but it's another way to cut down the cost of paper and stamps needed! While we are talking about how expensive paper can be, let's talk about programs. Let's be honest, most of them are going to end up on the floor anyways and people don't necessarily need to know the game plan for a 30-minute ceremony. I'm not knocking anyone who chooses to use them, they're great and I would have if I wasn’t on a budget! But if you are trying to cut down cost, this is an easy way to save a good chunk without feeling like you are losing out on anything. If you want, make a sign at the front that says who the wedding party is and the game plan! This maybe goes without saying but choosing homemade over rentals or buying things can go a long way. Make your own signs and have friends help you. Go to hobby lobby once a day with your 40% off coupon and go crazy. Not everything can be homemade, but when they can be, go for it! Truthfully, buying a suit can be just as cost-effective as renting. The two best months to buy a new suit is January or July. Spring fashion collections hit the stores in January, so hello price reductions. Alternatively the same happens in July. Also, Joseph A. Bank always has deals like buy 1 get 2 or even 3. So be patient and wait for a good deal, it's worth it! Real talk, you don't need alcohol to have fun, but offering alcohol does add some fun. I said it. But I get it, it's a hefty cost for something that is for sure not a necessity. One way to keep this cost manageable is to use a venue and caterer that allows you to bring in your own alcohol. This saves huge because otherwise it gets marked up a ton. While we are taking about alcohol, don't be afraid to just go with beer and wine. Maybe add a signature drink for the bride and groom's favorites if you want. But in my experience, beer and wine still brings the party without having to pay for the liquor. Buffets are great people! And surprisingly, they can save a good amount! For me, I didn’t have a choice to shop off the rack or not. We had about a 4 month engagement so I had to choose a dress that I could take home that day. Not only did it narrow down the choices which was great for me, but it ended up saving a good amount of money. Either way you'll probably have to get it altered so why not! When it comes to decorations, like floral and candles, etc. keep the photos in mind! Take aisle markers for instance, (that's the floral pieces that hang from each pew or chair in the aisle). What are you going to see in the photos that you keep forever and look back on? Probably just the first couple rows. So instead of decking out every row, just do the first two, plus it can mark reserved rows! That's just one example, but if you are going to splurge, do it in a place that will be heavily photographed. This one isn't for everyone, but I did it and I don’t regret it. The main reason I did my own makeup is because I'm scared to trust someone else with it. I didn’t want to not look like myself so to be sure, I just did my own makeup. No it certainly wasn't photoshoot quality, but I looked like myself and felt comfortable so I didn’t mind! Again, these won't work for everyone but many of these worked for me so I wanted to share them with you. It's your day, you do you. I hope these help you plan the wedding of your dreams while staying in your budget!